Fall is on the way. Winter is coming! It’s my MFT day so go check out the video with TWO cards in it! Good morning, Sandy! I want you to know that my 4-year-old son and I faithfully watch all of your videos (we watch them together while we eat lunch, and on days when my daughter is home from school, she gleefully joins us). Not only do I love to watch you color (and I’m always learning something from you), but I also know that he is seeing a wonderful example of masterful coloring, and I think it’s rubbing off on him, too. But wait–there’s more! We have been working on letters and numbers together, and when you add the marker codes (or in other videos, the numbers/letters for pencils, etc. ), he loves to practice his letter and number recognition! He is getting fast–it’s like a game!– and I am so excited that not only can we watch your beautiful art together, but it’s educational in more ways than I expected! 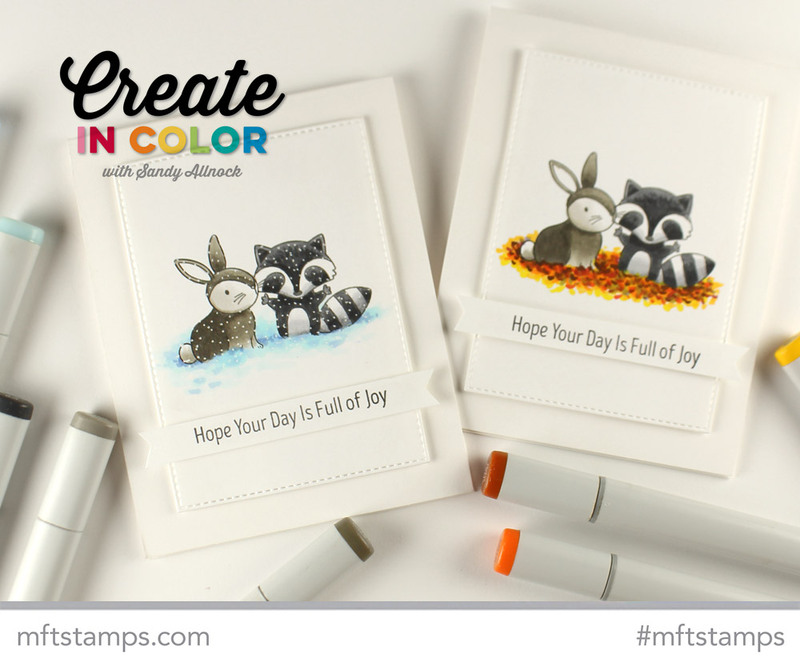 Love how you’ve used these stamps! Off to watch the video! Have a great day! So lovely and a great way to stretch your stamps, thank you Sandy! Great tutorial! The leaves and snow can be used with many stamps. Thanks! So cute. I love the lesson in the leaves. So adorable and so clever!